With the ever-growing trend of social media in professional sports, athletes are beginning to show their personalities in ways they aren’t able to through other mediums. Twitter has become a household name in the realm of professional athletes, and a number of players in the National Hockey League (NHL) are beginning to follow in the footsteps of their counterparts. Among the throng of personalities around the league, one stands above the rest in Paul Bissonnette, a forward for the Phoenix Coyotes. Bissonnette, known as BizNasty2point0 on Twitter, is the most active and also one of the most followed among NHL players on Twitter, a credit to his outgoing personality and unfiltered mind. When it comes to tweeting, there is no filter for Bissonnette which ultimately caused him to deactivate his original account after calling a fellow player a communist. By no means was he intending to stir the pot with his comments regarding a Russian player seeking a record-breaking contract, but it put him on the Twitter map. 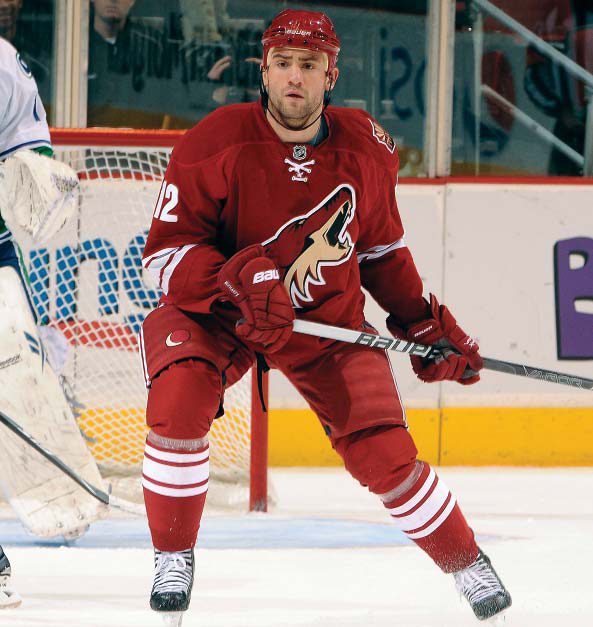 Fans are becoming increasingly aware of the online personality that is BizNasty2point0, something uncommon to fans as most players steer clear of opening up in the public eye. While most players are even-keel in the spotlight, Bissonnette thinks the majority of fans simply are not used to players opening up and showing their real personalities. Bissonnette has been known to walk the line in regards to what he posts, topics ranging from his hatred of the PT Cruiser, his overuse of toilet paper, a culinary masterpiece, tweeting while using the restroom (twooping), his fondness for ice girls around the league and posting pictures of himself with homeless people. Many fans are interested to read what “BizNasty” will tweet next, or the pictures he will post, but the majority of fans are unaware of the charitable work Bissonnette began due to his tweets. In the midst of posting pictures of homeless people on his feed, Bissonnette realized he could use his status to raise funds for homeless people and work in the community with those in need. Soon after, a charity was set up by Bissonnette to help local homeless people in the Phoenix area. Along with help from the Coyotes organization, they together brought 100 homeless people to a Coyotes game, set them up with transportation, a meal, and seats for the night. On top of doing charitable work for the homeless, Bissonnette is able to raise funds for other charities by selling shirts based on his tweets and other hockey-related material. Through a website he’s affiliated with, saucehockey.com, he is able to raise money through the sale of shirts and donate the funds to charity. Using Twitter is a way for Bissonnette to express his opinions and promote his charities, all in the matter of good fun, even if it the controversy continues. And as contentious as his tweets can be, he knows his boundaries now. An employee from the organization now monitors Bissonnette’s tweets to ensure nothing posted would harm his perception or that of the organization, but he said he still is able to flirt with the boundaries without crossing the line. It’s not easy being the center of attention for off-ice issues, yet Bissonnette is hopeful his character and lifestyle will inspire others to follow in his footsteps. Like Bissonnette, a plethora of NHL players have joined the social networking site to promote charities, non-profit organizations, raise awareness and also interact with fans. Matt Carle, a defenseman for the Philadelphia Flyers, recently created a Twitter account to donate money to Children’s Hospital of Philadelphia (CHOP). Carle researched the site and then created his account with the intention of donating $10,000 to CHOP if he was able to gain 10,000 followers by the end of the season. Within a week, he had reached the feat and donated the funds. With the help of the Flyers public relations staff and fellow teammate James van Riemsdyk, the only other Flyers player on Twitter, Carle said he was able to quickly spread the word of his account and generate awareness. Prior to joining Twitter, Carle was unaware of how much interaction he could have with fans on a daily basis. After van Riemsdyk convinced him it was a way to interact with fans and friends, he set up his account. Carle said he and his wife soon hope to start another charitable event or create a way to raise money and awareness through his account, something he said he wants to be creative with and use it for a good cause. Players are hoping to portray a positive image to fans using social media, while the league and even player agents are convincing their players to express their personalities by using the site. The Flyers’ forward is hopeful he can follow in the footsteps of his teammate and find a charity to work with and promote it through Twitter. New York Islanders forward Matt Moulson said a league-wide meeting at the NHL offices in the summer spread the word about social media and said it was a good idea for the players to develop a rapport with fans. Michael Grabner, Moulson’s teammate, swayed him to use Twitter after he had used it periodically while on a different team and after listening in on the league meeting regarding social media. Grabner and Moulson constantly tweet back and forth about games, their life during road trips and are increasingly attempting to garner attention towards their stuttering franchise on Long Island. Both said they hoped they could use the site to mingle with fans and gain an outside perspective from fans in relation to the hockey world. Twitter is growing in popularity and athletes are beginning to join with the hope of raising awareness and building a rapport with fans. It’s all about branding, and if players can make a name for themselves on a national level it’s more than appropriate. Professional athletes need to open up more and be encouraged to show their personalities on a regular basis, something blue collar, uncensored and real. That’s hockey, and that’s what social media is bringing to the table.